Camping has always been the most thrilling essence of adventures to be taken. You have made a perfect plan with your friends to go for a camp and listed up all the stuff that you will be needing for it. 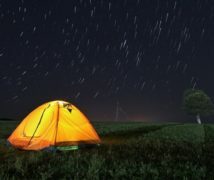 And since you will be camping out, the most essential thing that you will focus on heavily will be your tent. Yes, it is completely understandable that your tent must be strong and durable to withstand any kind of weather, but ever wondered what can deceive you the most and ruin the whole camping mood? It’s those little stakes. Just like your home, tent too needs some pillars on which you set your shelter. So, they also need to be strong and durable just like your tent. 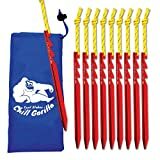 How To Properly Set Your Tent Stakes? When it comes to the quality of the material and construction, the products win all the match. Even weighing light and being compact, they have been able to be durable enough for a pillar of aluminum. 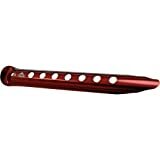 Moreover, these tent stakes are also able to hold the ground snugly and easy to pull them out from the ground as well. And this will not even cause them to get bent or broken since they are enough strong to withstand that. To add more, because of their compactness, TNH Outdoors are also easy to carry them so that you can take them to any camp you want. I think if the straps were a bit longer, then it would be more easy to pull them out of the ground. Besides, they might not work well if you slam them to hard soil. 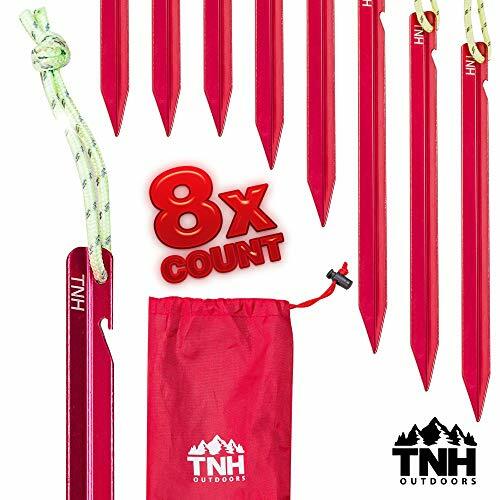 If you are planning to go on a summer camp and looking for unbreakable stakes that will hold the ground tightly then TNH Outdoors are the perfect tent stakes to get. You can call them a pro for being able to grip quick in loose ground. Be the surface is sandy or snowy, these exceptionally long tent stakes know how to show their skill. However, the best part is that you will get six holes in them so that you can possess multiple rigging options to tie them down. And the color is vibrant enough to easily spot them in the ground. Yes, it’s the aluminum alloy that has been used to construct the stakes, and since the material is soft so it can cause them to get bent if you thump them in any surface other than sand or snow. And you can complain for making a little extra effort while carrying them since they are found pretty bulky. The most disappointing is that you cannot even fit all kinds of loops over them for their blades being wide. 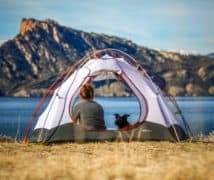 Camping over the snowy and sandy surface is a thrill to experience and if you want to build your own stronger tent then these will be a great choice. 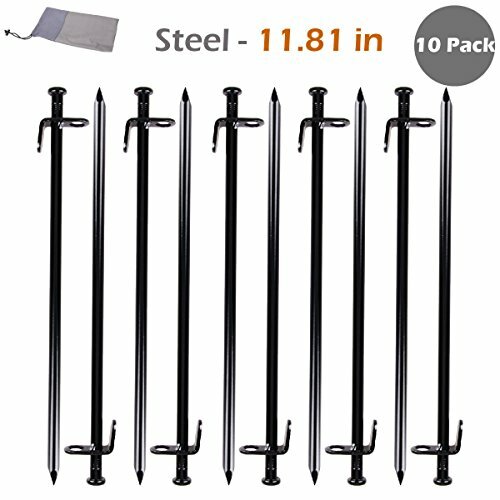 These tent stakes appear in a twist style in their design so that they can have extra power to hold the ground no matter how much windy the conditions get. Coming in red let them to spot easily in the ground. Additionally, they have a cord tied on top that eases to pull them out. If you guess them to be easy breezy for carrying them, then poking the bubbles, you are wrong. They are quite heavy. And since the manufacturer does not offer stuff sack with the products, it becomes quite difficult to get one due to their extra length. If you plan to have your beach camp in windy conditions, they will be an ideal option to own for fitting them to the ground for your tent. 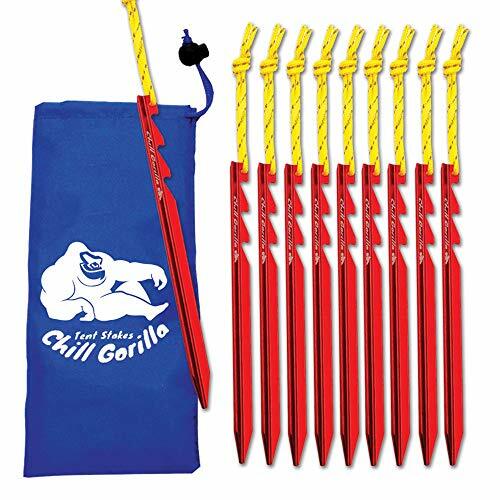 These Blizzard Tent Stakes have been designed to be suited for holding both sand and snow terrain for your camp. Having six holes in their shaft gives you a variety of rigging options for tying your tent. 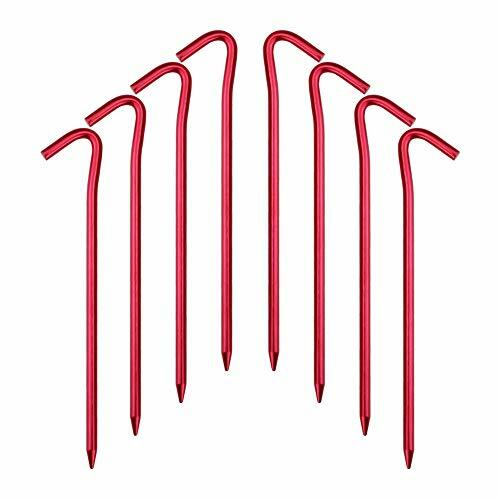 Moreover, you can also use these tent stakes as a deadman anchor. They are not ideal to be used on any other terrain other than the recommended ones due to their length. Even if you take a chance, you might find them getting bent. If you have bucks you can certainly get them for grabbing loose grounds like sand or snow to build your tent. Hunting for a couple of foolproof stakes? Then you must have a look at the ones from TRIWONDER. 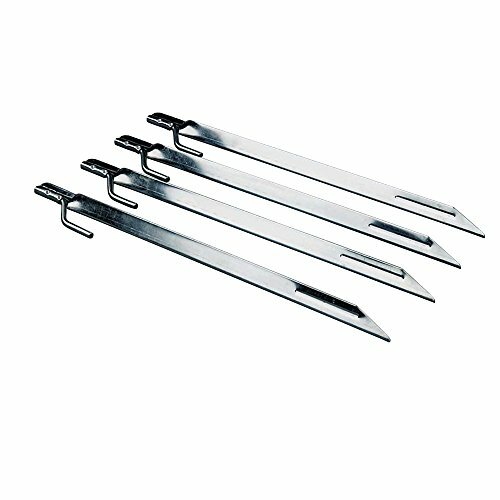 Coming in nail design, they are the perfect tent stakes to hold the roughest of the rough terrain which other products might fail to do. Constructing in steel with thin design does not only make them easy to push in but also pull out of the ground. They won’t even get rusted easily that proves their durability. I must tell you to have a hammer as you will need them for driving them into the ground. As for size, you will find them a tad bulky. However, they might also not work well with wet soil for the coat, so you should check the ground before using. 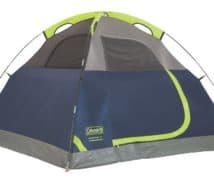 They will be great for either base camping or holding down bigger canopies. And they know how to get a grip of rougher ground to strongly build your tent even in windy weather. Chill Gorilla tends to be appeared in Tri-Beam blade design that makes them quite great for owning holding power. Since they have got three latch options so you will find them quite useful. You might need some rocks or hammer to pound them to the ground as they cannot get through it by hand. Because of the pressure needed for use might also impact the durability of the stakes. If you want to have a couple of extremely lightweight stakes, then they make an ideal choice. You can use them for any kind of outdoor activities. 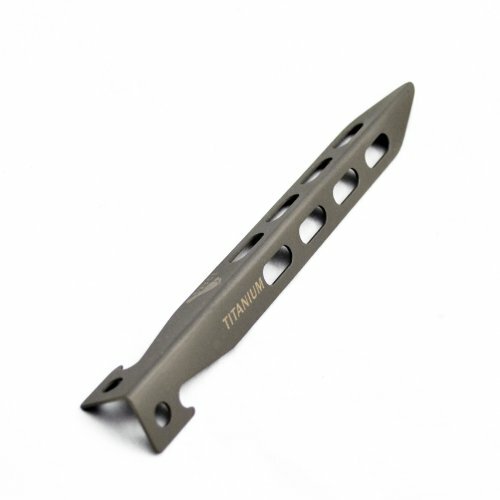 The Hikemax stakes have been found extremely lightweight to put them in your bag and the best part is that they are quite petite to take minimal space in your bag. 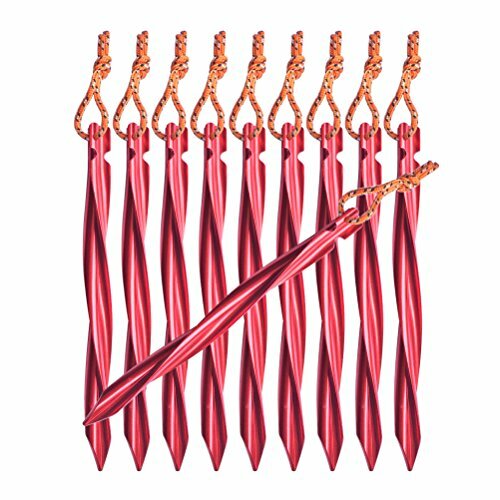 The color, the loops will definitely help you locate the stakes and take them out easily. 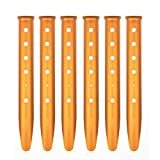 They come in blade shaped design that proves them ideal for softer sand. And once you hammer it properly, they also prove their strength in performance. Using them in softer terrain might cause them wiggling out of the ground if you push them in partially. Hence you will get them quite annoying in this matter. Moreover, it will be better to avoid using them for bigger tents as they come in lightweight. Since they weigh extremely light, you will find them great for using them in softer soil. They have all the qualities to make them ideal stakes for building a stronger tent- strong wise and durable wise. And it’s the material for which they are able to show their performance even after several years of use. You might find them shorter and avoid using them in softer or loose grounds. 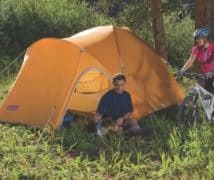 Although they are not suitable for sustaining larger tent, but if you want to camp with small sized tent with a sole intention to house yourself solely, then yes, they are the perfect tent stakes to own. 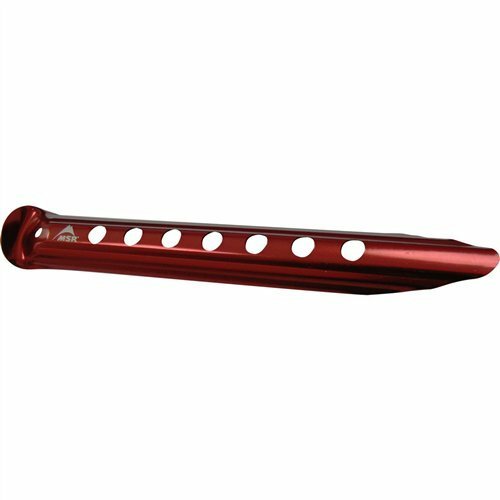 The Coleman steel tent stakes are made out of heavy-duty steel to assure you great durability. You can use them on any surface even if it is very hard. There are times when you face challenges when trying to erect your camping tent. 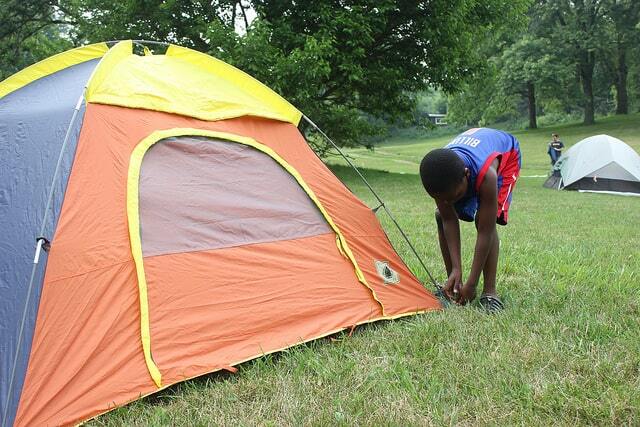 If you are going camping on hard grounds, they will make your work easy when trying to erect your tent. They are sharp enough to penetrate the hard ground. Finally, You will use them for long before you can think of a replacement. They come in a pack of four. If you need more, then you will have to buy several packs. They make the process of mounting tents on hard surfaces very easy. 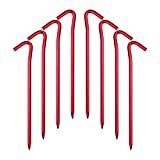 The twist shaped stakes are definitely a good buy when it comes to using them in sand and loose ground. Moreover, they also own multiple blades that make them ideal for holding both the tent and the ground. Besides the durability, the brand also provides loops so that it becomes easier for you to pull the stakes out when you are done camping. 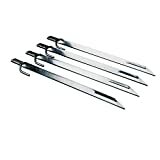 They tend to be called the best tent stakes for their outstanding performance. You might find them quite heavy in size. Besides, you will be needing an extra instrument to drive them in at deeper angle. However, the use of hammer can weaken the strength of the stakes so you must be careful while thumping them. 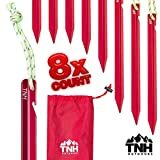 They are the perfect tent stakes if you want to have your camp on soft or sand terrain. You can consider using them for longer term if you hammer them carefully. It is essential to think of why you will be using the stakes for prior to buying them. 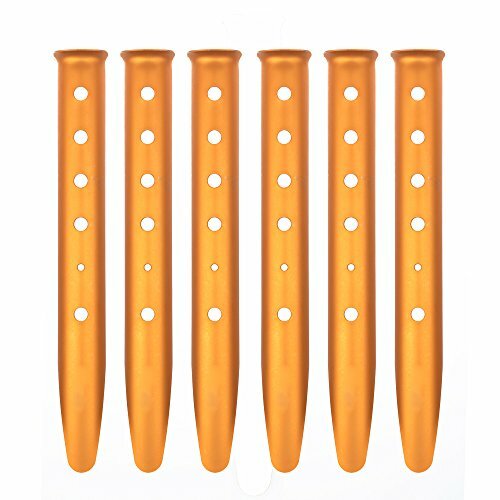 Because you will need different stakes for different purpose, terrain and outdoor activities. 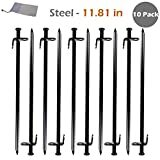 So if you don’t want to ruin the mood of your camping, you will surely need to ponder what kind of tent stakes do you want. If you are planning to get them for backpacking or for hiking it will be better to use the ones that will weigh light. If you have a plan for longer adventures, think about getting a stronger and more durable one. The tent stakes basically tend to be made from aluminum, steel and carbon fiber. While steel is considered to be the most durable one and carbon fiber be the most lightweight one, Aluminum is a kind of material that is found in between the range. However, you will find a lot of stakes that have used multiple materials. Think about the titanium. These kind of stakes are quite solid. Tent stakes tend to come in a lot of shapes and each of the shapes has a different purpose of use. They are pretty long stakes that offer a substantial power of holding the ground. Besides, you will get them suitable for camping adventures if you are cool with its heftiness and size. They resemble nails but come larger in size and T-shaped in design. The upper section possesses a head resembling a nail and the rest is straight owing a pointy tip. However, you can hammer them down to the ground but they won’t break easily. This kind of stakes copies the shape of the letter V. For their structure, you will find them easy to drive into the ground. Besides the structure, their robustness is also another great factor found in these kinds of stakes. And since they don’t break easily, you can slam them to roughest terrain with ease. These stakes have been designed to use only on a snowy surface. Although you will find them pretty long and heavy, however their curved with holes design helps you to fix them in just after you push them to the ground. Coming in Y-shaped, these stakes are perfect to drive them into all kinds of surface. With flat head and pointy tip, they have a good resemblance of single piece nail but due to its thickness, you will find them long-lasting and quite strong. As is with any structure, a strong foundation is paramount. Tents are no different. The difference between a blown off tent and a strong tent has a lot to do with how the stakes are set up. Use the right stake for the right terrain. Different terrains require different stakes. Drive the stake into the ground at a 90-degree angle for maximum hold. Hammer down the stake with a stake hammer or a large rock to ensure they go all the way down for extra hold. Ensure the hook of the tent stake should face in the direction of the tent. Reinforce the weak stakes by placing heavy materials like rocks on them. Plant the stakes on firm ground to prevent them from easily coming off. There you go. This was our best tent stakes reviews that you were waiting for. Hopefully, you will like this piece and we hope we were able to help you choose the right tent stakes according to your budget.